More exciting new animadoc events! Deadline 14th April. 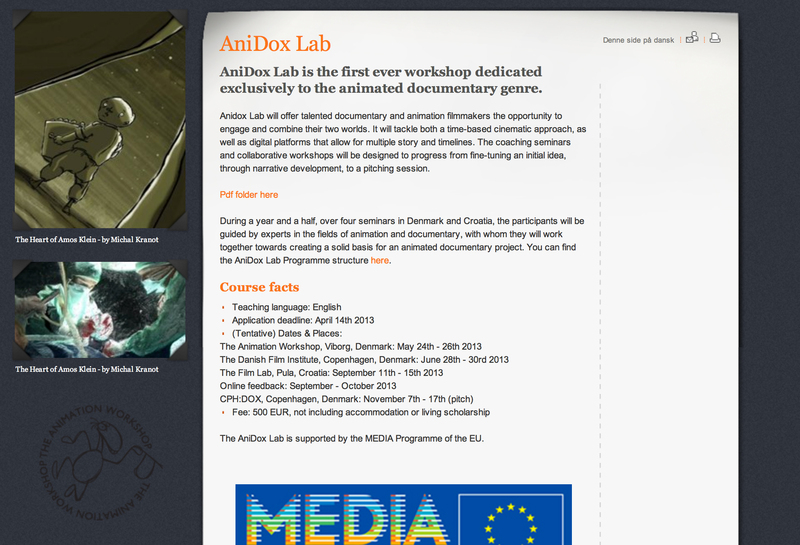 ‘AniDox Lab is the first ever workshop dedicated exclusively to the animated documentary genre. ‘Run by The Animation Workshop, Anidox Lab will offer talented documentary and animation filmmakers the opportunity to engage and combine their two worlds. It will tackle both a time-based cinematic approach, as well as digital platforms that allow for multiple story and timelines. The coaching seminars and collaborative workshops will be designed to progress from fine-tuning an initial idea, through narrative development, to a pitching session. ‘During a year and a half, over four seminars in Denmark and Croatia, the participants will be guided by experts in the fields of animation and documentary, with whom they will work together towards creating a solid basis for an animated documentary project.